What's New in Grapher 8? Grapher is the ultimate technical graphing package available. This easy-to-use, powerful, and dynamic program will have you creating publication-quality graphs in minutes! The superior, professional, impressive graphs will be wowing your audience every time they see your graphs. Create informative graphs with legends, magnifiers, and multiple plot types in the same graph! Customize any portion of any graph to make the graph completely unique to your situation! Create your own custom graphs by using the updated easy to follow Graph Wizard. Organize your objects in the improved Object Manager and edit your graphs in the updated Property Inspector! Save the graphs in Grapher 5, Grapher 6, or Grapher 7 GRF formats or Grapher 5, Grapher 6, or Grapher 7 GPJ formats to make sharing documents between colleagues easier than ever! Record your graph making process with the Script Recording feature inside Grapher! Create one of 54 unique graph types. There are four different types of 2D graphs that can be created in Grapher: linear, bar, polar, and specialty graph types. In addition, many of these graph types are available with a 3D aspect. If you need an extra variable plotted on your graph, try one of the 3D XYZ graphs, the contour maps, or surface maps! All graph types in Grapher give you full control over all graph parameters. Combine multiple graph types to present your data in a completely new way! Alter any property of any of the graph types to create compelling new graphs. You can accept the Grapher intelligent defaults to automatically create a plot, or click any aspect of the graph to easily customize those features. Line, Scatter, and Line/Scatter plots display data as a line, as symbols, or as a combination of line and symbols. Alter line colors, symbols colors, or fill between curves. Line/scatter plots can have multiple axes and curves. You can change line properties for individual curves or fill curves. 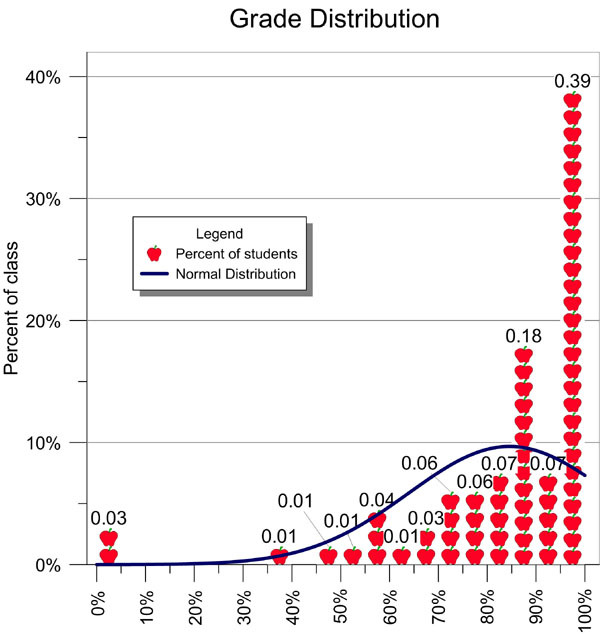 Class scatter plots allow symbols to be based on a range of data values in a worksheet column. In addition to class scatter plots, regular symbol plots can be created with different symbols based on information in a column or in a symbol table. Class scatter plots have variable symbols with separate properties. Symbol size, shape, and color can change depending on the value in your class column in your worksheet. Function Plots display mathematical functions. Plot Y as a function of X, or plot a parametric equation where X and Y are a function of a third variable, T.
Specify a function or equation to create a graph. Position the axes anywhere on the page. Break axes to reveal interesting trends in your data. Step Plots display linear data in a similar manner to line/scatter plots. Except, with step plots, connecting lines are only vertical and horizontal. All other parts of the plot are editable exactly like the line/scatter plot. Legends and graph titles can add informative information to any graph! Display lines with any color, width, opacity, or style. Use a worksheet column to change the color of lines within the curve. Display symbols with any shape, color, or opacity. Change the frequency of symbols to control how many symbols are plotted on each curve. Use a symbol table to vary the symbol for every point. Use a symbol column to define the symbol shape from a worksheet column. Match the color of the symbol to the color of the line automatically. Drag point labels to place them exactly where you want. Fill under, above, to the left, to the right, or between curves. Add fit curves and confidence intervals. Add error bars that display statistical information about the data. Error bars can also be displayed from a worksheet column. Limit the display of lines and symbols to only a desired subsection of data. Use a worksheet clipping column to control the display of points. Add a graph title or legend to enhance your graph. Adjust the opacity of all objects in the graph. Bar type graphs display data as boxes, cones, spindles, diamonds, or as an image. All bar type graphs can be displayed either horizontally or vertically. As with all graph types in Grapher, you have full control over all graph parameters. Bar charts are made from XY data in a worksheet. The bar is shown at the height indicated in the worksheet cell. Alter line colors, fill colors, orientation, or bar chart shapes. Bar charts can be stacked or adjacent, when multiple data exists for each value. Bar charts can be filled with different colors, display labels, or be variable widths, depending on your needs and preferences! Floating bar charts display similar data except that the bar has both a minimum and maximum defined in the worksheet. All settings can be changed in a manner similar to bar charts. Display horizontal or vertical bars! Add text labels, overlay multiple bars, or use dates – whatever you want to display; Grapher has a way to make your data stand out! Histograms display data in groups or bins. Each bin represents a range of values on the X axis. The height of a bin represents the number of data points that fall within that bin’s range. 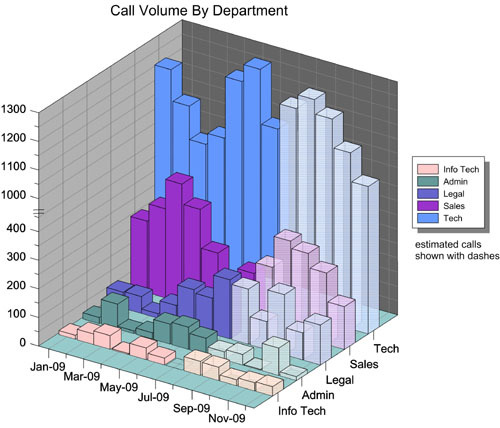 Histograms can display data as a count or as a relative frequency. Use an image fill to make your graph more exciting! Add legends, labels, and fit curves to more accurately represent your data. Display bars either as stacked or as adjacent bars. Vary the bar width based on a worksheet column. Set the bar width to a percentage of the axis or as a fixed width. Display bars vertically or horizontally. Display fill with any color, gradient, style, or opacity. Use a worksheet column to set fill color. Use a color table to set fill color. Display bars as boxes, cones, spindles, diamonds, or any image you desire. Add labels to your bars. Add a fit curve to histograms. Limit the display of bars to only a desired subsection of data. Polar plots display data on polar coordinates, using degree, radian, or grad data versus a radial distance. The degree, radian or grad data are displayed on a circular angle axis. The second axis is a radial axis showing the distance from the center of the circle. Polar plots can display mathematical functions, line/scatter data, bars, or classed scatter plots. As with all graph types in Grapher, you have complete control over all aspects of the graph. 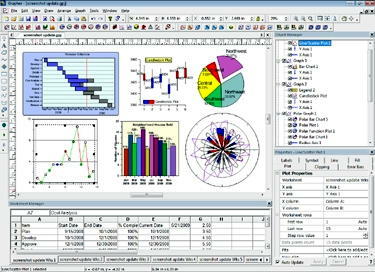 Polar line/scatter plots display data as a line, as symbols, or as a combination of line and symbols. Alter line colors, symbols colors, or add labels. Polar line/scatter plots can use the same symbol or varied symbols for point locations. Add lines connecting the points or display only the symbols. Polar class scatter plots allow symbols to be based on a range of data values in a worksheet column. In addition to class scatter plots, regular symbol plots can be created with different symbols based on information in a column or in a symbol table. Display classes with different colors or shapes. Limit your points to inside the polar area or allow points to go outside the area. Use text labels for axes for clarity. 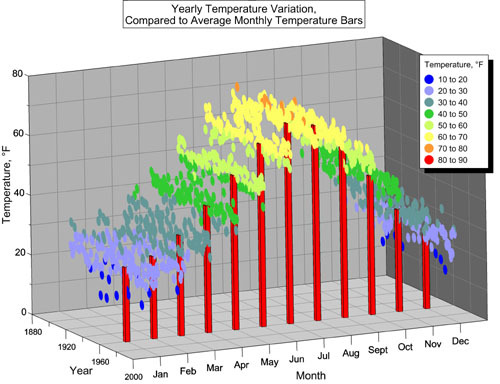 Stacked polar bar charts allow comparison of multiple sets of data on polar axes. Create multiple plots on the same graph and add colors to differentiate between each curve. Radar graphs, also known as spider plots, are new in Grapher 8! 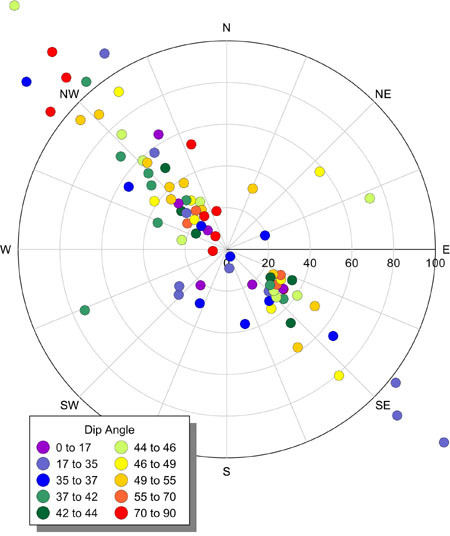 The radar plot has a similar appearance to other radial graphs, except there are multiple radial axes and no angle axis. A radar graph is a graphical method of displaying multiple variables. Comparisons between multiple radar plots typically show trends in your data. Radar plots have an additional axis for each new variable. Display multiple data sets on the same graph, overlaying the plots, and filling with a partial transparency to see all the options. 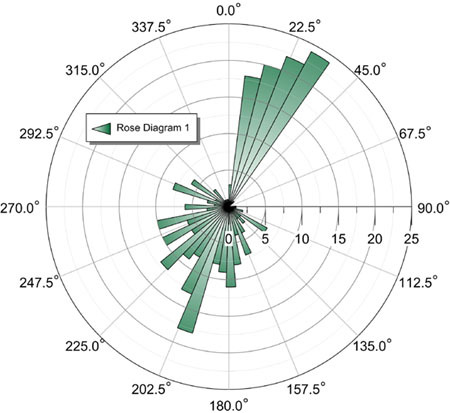 Rose diagrams display statistical data like a histogram, showing the number of occurrences of an event that fall within a specific angular region. Bins are fully customizable in rose diagrams! Show unidirectional or bidirectional data on a rose diagram. Wind Charts graph frequency vs. wind direction. Bins are created according to the wind speed. The frequency can be viewed as counts, relative frequency, or as percentages of relative frequency. Bins are fully customizable! Display polar wind charts using class colors. The stacked classes reveal the total distribution in each wind direction. Display any portion of the polar plot. 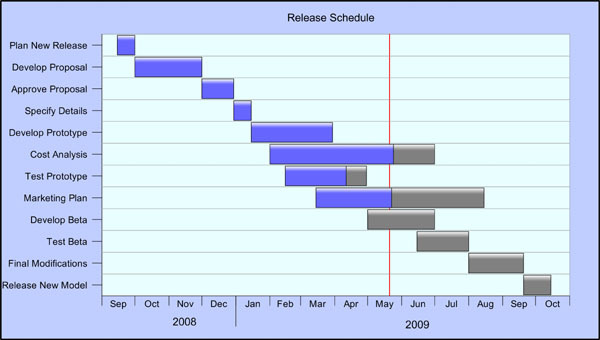 Display polar bar charts either as stacked or as adjacent bars. Specialty graph include graphs such as box-whisker plots, ternary diagrams, or stiff diagrams. Each graph has its own rules and displays in a completely unique way. As with all graph types in Grapher, you have complete control over all aspects of the graph. 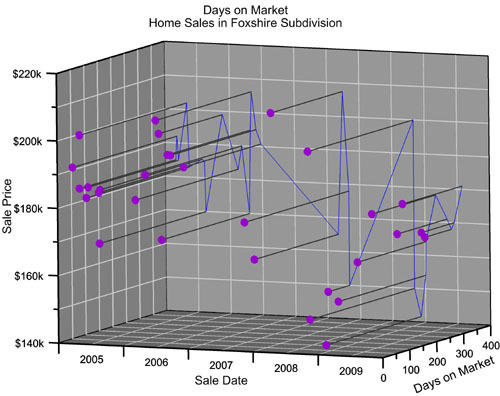 Box and whisker plots display statistical data. Each column is assigned to a box. The box top-bottom values are defined by the 25th percentile and 75th percentile. The whiskers are the minimum and maximum values, unless outliers are defined. Then, the whiskers can be changed with an outlier definition. Box and whisker plots allow complete control of all line colors and styles, symbol colors and shapes, and fill colors. Display outliers on a box-whisker plot as symbols or as whisker lines. Compare multiple sets and change the properties of each. Bubble plots display three variables on two axes. The third variable is shown in the size of the bubble. All aspects of the plot can be changed, including the bubble symbol, line properties, and whether labels are shown. Bubble plots display variable symbol sizes, based on data in a column. Axes display with multiple options such as dates or reverse direction. Hi-Low-Close plots display a range of Y values at each X value. These plots are commonly used to display the high, low, opening and closing of stock values, though Hi-Low-Close plots are also used for many other purposes. 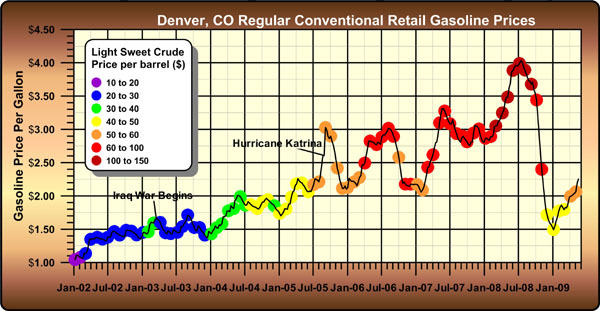 Hi-low-close graphs can be displayed with the standard line or with bars, the "candlestick" graph. Display multiple axes and multiple graphs on each page. Add a graph magnifier to highlight a subset of your data. Pie charts can show multiple slices, with full customization of each slice, including labels, fill color, and explosion factor. Stiff diagrams can be used to display water quality. Stiff diagrams show relative concentrations of multiple cations and anions. Stiff plots can be color filled to aid in the interpretation of the graph. Ternary diagrams show the relative proportions of three variables on three axes. Choose to show the relative proportions as percentages or as fractions. Add lines to connect the points on the ternary diagram! Display any column for the labels or show relative proportions for labels! Zoom in on an area of interest! Zoom in on a section of a ternary diagram to reveal more detail! 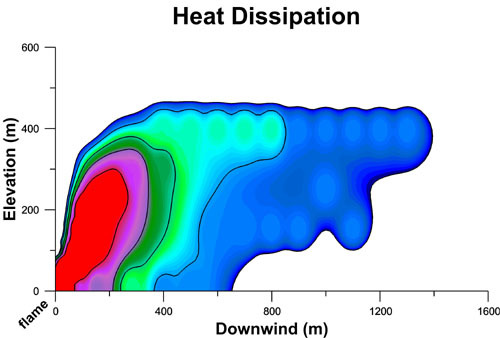 Vector plots are used to show the starting and ending point of a variable, such as wind or current. Grapher allows you to set the starting XY position. The ending position can be specified with angle and magnitude or ending XY position. Add line/scatter base maps to add locations to your vector maps! The 3D XYY graphs are graphs that contain two variables and are displayed with a 3D view. Most 2D XY Graphs can be displayed as a 3D XYY graph. 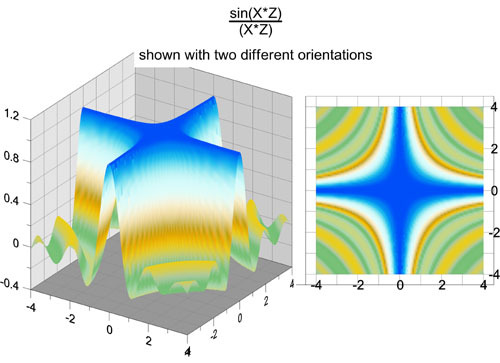 3D XYY graphs display the same types of plots as 2D XY graphs, but with a 3D view. These adjacent ribbon/wall plots are one example of the ways to move the plots in 3D space. 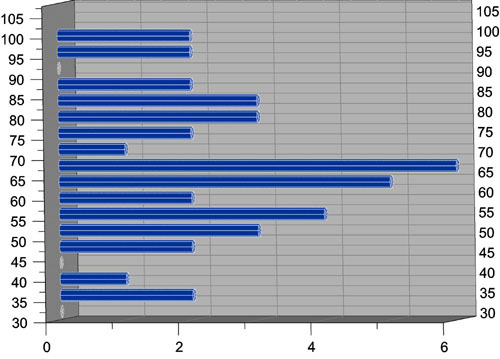 This 3D XYY histogram is displayed horizontally with a cylinder for each bin. All 3D XYY bar chart type graphs can be displayed vertically or horizontally with different shapes for the bars. 3D XYY pie charts add an extra oomph to your pie charts for the most visually appealing presentation possible. Rotate graph to any direction with the easy to use 3D trackball. Make the width of the 3D XYY graph from 0 to 6 inches. Add grid lines on the side walls and back wall. Change the fill color or style for the side walls and back wall. Show labels at the same angle as axes or parallel to the screen. Most 2D plot settings apply to the similar 3D XYY plot. Change the line color, width, or style for any plot. Change the fill color, direction (if applicable), and pattern for any plot. The 3D XYZ graphs are true 3D graphs that contain three variables. All aspects of the graph can be altered, exactly like the 2D and 3D XYY graphs. Break axes, display date/times, or add legends and text. Grapher has an unlimited number of ways to present your data! Combine graphs such as class scatter plots and bar charts to more effectively display your data! Add a projection and drop lines to any wall of the 3D XYZ line/scatter plot graph! 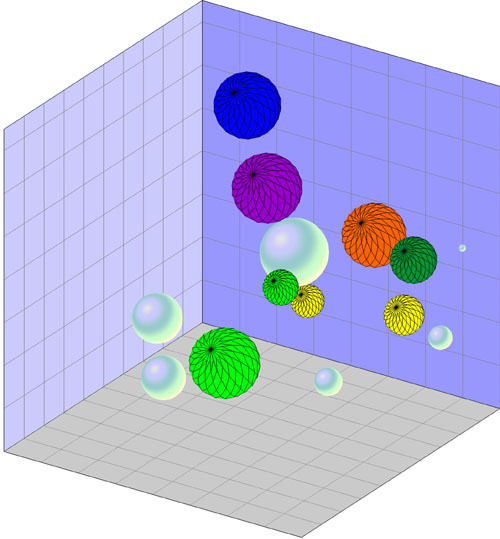 Use a 3D XYZ bubble plots to display four variables, using the size of the bubble as the fourth variable! Use gradient colors or solid colors for bubble color! Make the length of each axis on the 3D XYZ graph from 0 to 6 inches. Add symbols to 3D XYZ line/scatter plots. Display labels and move them to your desired location. Contour maps can be displayed over any contour range or interval. You can color fill the contours in any way you would like. Add a color legend to make reading the contour map even easier! Contour maps can be created directly from a data file or from a Surfer GRD file. As with other graph types, you have full control over all options. Contour maps can be color filled to highlight your data! Contour maps can be added to surface maps to aid in interpretation! Use the defaults or set the minimum and maximum contour values and the contour interval. Display any fill color between contours. Display lines with different styles, colors, and widths for each contour line. Add a color scale bar legend. Grid data directly in Grapher using Inverse Distance to a Power. Import grid files from Surfer! Display contour maps in XY or XZ plane. Overlay a contour map onto a surface map or display the contour map at any elevation. Rotate the map to any desired angle. Define custom line styles and fill styles. Surface maps display XYZ data in a smooth color filled surface. Surface maps use color and shading to emphasis changes in data. Rotate the surface map to any desired angle. Add 3D line/scatter plots. 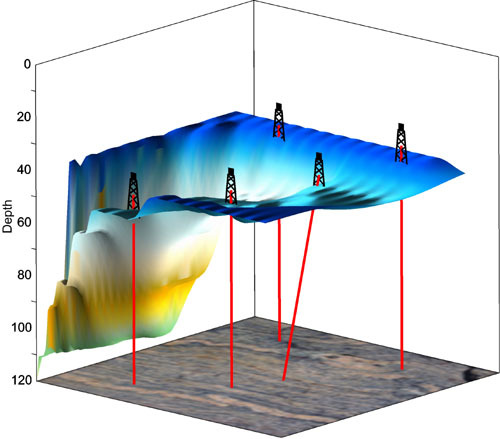 For example, this 3D surface map displays an open pit with drill holes penetrating to the bedrock below. Display functions, grids, or data as a surface map. Display any fill color spectrum for your surface. Add a color scale bar legend to explain the data values corresponding to each color. Specify surface color gradation, shininess, base fill and line color. Overlay contour maps, surface maps, and other 3D maps to more fully show your data. Control mesh line frequency, color, style, surface offset. Set lighting horizontal and vertical angles, ambient, diffuse, and specular properties. Choose overlay resample method and resolution, color modulation (blending) of surface and overlays. Graphs can be customized in many different ways. Each portion of the graph can be altered to fit your needs. Customize your graph in any way you want, change color fill, add magnifiers, text, and axis labels. Add legends, graph titles, and axis titles and labels. Show tick marks at any interval. Show date/time or labels from a worksheet on axes. Display point labels on most graph types. Rotate graphs to any desired view. Change the axes lengths to meet your needs. Customize any color to make exactly the right shade or hue. Set the axis limits to any values, regardless of your graph data. Add symbols, polygons, polylines, spline polygons, spline lines, or text. Add a drawing insert zoom or a graph magnifier. Add multiple curves to each graph. 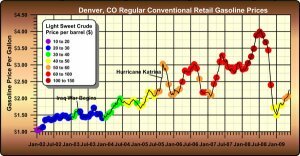 Add multiple axes to each graph. Display multiple graphs on a page. Associate any number of fits with a single curve. Change the line style, color and width for each fit. Applicable statistics are available for each fit. The resulting statistics are copied to the clipboard or displayed in a report window. Export fit curve data to a worksheet to calculate additional statistics. Change the range of data used to create the fit curve and the range of values to display the fit curves individually. Add confidence intervals to your fit curves to show the degree of confidence that is in the fit. Fill between confidence upper and lower bounds to highlight the certainty. Grapher has four axis scales: linear, logarithmic (base 10), natural logarithmic, and probability. Use Grapher's default settings or specify custom settings for all axis parameters. Set the axis scale, change the axis length and starting position, add additional or duplicate axes, change axis limits, enter an axis title, add grid lines, break the axis, or hide the axis on your graph. On each axis, you control the major and minor tick frequency and spacing or you can use Grapher's default settings. If the data uses date and time as one of the data columns, axis labels are automatically generated using dates and times. In addition, manual date/time labels can be created or labels can be read from a worksheet, allowing you to use any type of tick labeling. The updated Graph Wizard is an easy to use step by step command that creates a graph for you using default, customizable parameters. Select the type of graph, the worksheet and the columns to use and the wizard does the rest. Add curves to existing graphs or create new graphs with the wizard. After the graph is created, it can be edited by double clicking on any portion of the graph. Use the object manager to easily select, arrange, or delete the objects in your graph. The object manager makes the editing of any object simple. It displays all the objects in the plot document in an easy-to-use hierarchical list of objects. The objects can be selected, arranged, removed, and renamed in the object manager. When an object is selected in the object manager, it is also selected in the plot window. Changes made in one location are automatically reflected in the other. Select multiple objects at one time to make editing even faster! Click and drag objects in the object manager to change the drawing order in the graph. Make changes to the graph in the property inspector and the graph automatically updates to show the change. When an object is selected in the object manager, changes to the object can be made in the property inspector. The property inspector is a docked window that is always displayed on the screen. You can make the property inspector floating or close it, if you do not want it to display. All of the properties for an object are listed in the property inspector. For instance, in the Graph 3 selected in the above object manager, you may want to change the background color or style. Once the object is selected, the change can be made immediately in the property inspector. The change automatically updates the graph. Labels can be added to most graph types. All properties of the labels can be changed easily, including numeric format, adding bold or italics, changing the font size or style, or changing the label color. In addition, labels can be moved so that neighboring labels do not overlap. Grapher adds the ability to quickly move labels for most graph types with the mouse. Select only the label you want to move and effortlessly drag it to a new location. Labels can also be moved with the keyboard for finer adjustments. Most graph types also support curve filling. Fill can be defined between two curves or by using a single curve. With a single curve, fill above, below, to the left, or to the right of the curve. Choose to fill to the axis minimum or maximum or to a customized data value. Display, enter, edit, print and save data. Double precision capabilities allow up to 15 digits without loss of precision. Import data files in the following formats: XLS, XLSX, DBF, MDB, SLK, WKx, WRx, CSV, TXT, DAT, BNA, and BLN. Save your data files in XLS, SLK, CSV, TXT, DAT, BNA, and BLN formats. Cell formatting includes background colors and cell height and width. Include formatting information when copying to the worksheet. Sort data using multiple columns. Calculate numerous statistical functions on individual columns of data. Select a point on the graph and highlight the point in the worksheet. View a list of all worksheets associated with a graph. Export data from fit curves, function plots, histograms, rose diagrams, and wind charts to create new data files. Update command allows worksheets that are edited in other programs to update immediately in Grapher. Embedded Excel window allows the use of Microsoft Excel from within Grapher. Create mathematical transforms on columns, rows, or individual cells. Search, find, and replace values throughout the worksheet. Directly reference MDB tables. Have the graph automatically update when the MDB changes. Automate Grapher from any Active X Automation compatible client such as Visual BASIC or use Golden Software's Scripter. Record scripts directly in Grapher using the new Script Recording feature! This allows you to record all of the steps necessary to create any graph. Embed and link Grapher into other applications. Embed and link documents from other applications into Grapher. Edit multiple objects at once. Customize Grapher by selecting the default settings. Customize most settings for each graph type! Control line styles, color, opacity, and width. Add drawing objects to any graph such as points, lines, polygons, rectangles and ellipses. Create custom colors, lines, and fill patterns. Reshape polylines and polygons using the reshape tool. Combine and break apart composite objects. Rotate all drawn objects, imported objects and graphs. View all objects using the Object Manager. Edit all objects in the tabbed Property Inspector. Keep the Object Manager and Property Inspector available -- even while editing. Lock the position of any object to prevent accidental movements. Use the Arrange command to move objects forwards or backwards. Add a variety of arrows to the ends of polylines. Digitize data from a graph using a large crosshair that extends to the rulers. Write the data to a ASCII file to create new graphs. Fix the digitizing process directly to the line or digitize anywhere in the plot window. Display and edit detailed areas of a graph using the Zoom commands. Calculate the area under a curve. Switch between two different plot types. For example, change your line plot into a bar chart. Switch between 2D and 3D XYY plots. For example, change your line plot into a ribbon/wall plot. Use commas for decimal separators. Use any character for thousands separators. Reload all data for a graph with a single command. Change the worksheet for any graph. Click on a graph and have the data highlighted in the worksheet. Copy and paste graphs into most Windows applications. Print to any supported Windows printer or plotter. Minimum 128 MB RAM above Windows minimum requirements.